What Do Numbers Really Tell Us? Children learn by example and practice. If parents read, their children are more likely to read. When parents demonstrate decision making based on accurate and reliable information, a child acquiring such a skill becomes more probable. In fact, even adults learn by example. 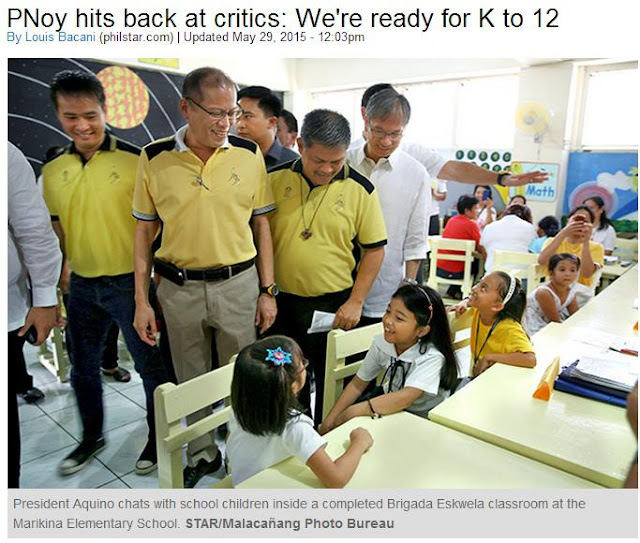 It is unfortunate then to read the response of Aquino to critics of K to 12: "Minsan ho talaga 'yung mga kritiko natin, minsan sila lang ang anak ng Diyos at sila lang ang magaling. Kaya bahala na ang Diyos sa kanila." (Our critics seem to think they alone are the children of God and that they are the only ones who are competent, so let God take care of them.) This is from a speech given by the Philippines president who is proudly proclaiming that the government is indeed ready for the new curriculum. Of course, the photo bureau from the palace is quick to provide a picture that depicts a nice classroom. 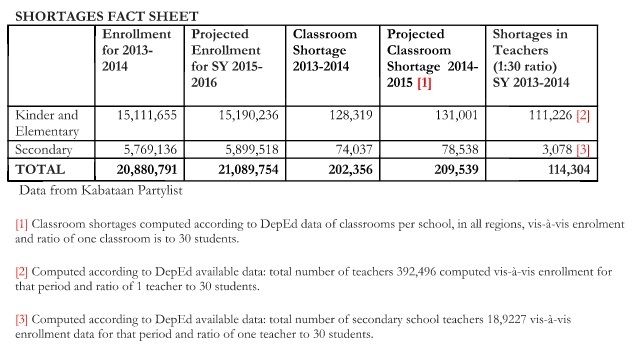 DepEd's K to 12: "Stop the School Bus" or "Damn the torpedoes; full speed ahead!" Education reforms that are not supported by evidence can have serious and negative ramifications on both students and teachers. Wrong measures are unfortunately never innocuous. 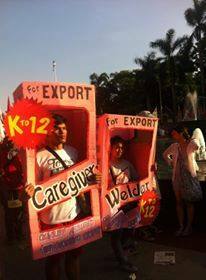 Proponents of DepEd's K to 12 must go beyond reciting platitudes and making outrageous promises. A reality check is now more than ever imperative. The mere fact that the new curriculum has already been in place for the past three years can never justify a continuation on the same misguided path. Of course, the right time to stop DepEd's K to 12 was three years ago but this does not mean that it is no longer correct to dump a wrong curriculum. Yesterday was better, but today is still a gazillion times more desirable than tomorrow or never. In addition to the intrinsic weaknesses of the curriculum and the low quality and availability of learning materials, the following only demonstrate how utterly unprepared the government is in implementing the K to 12 curriculum. 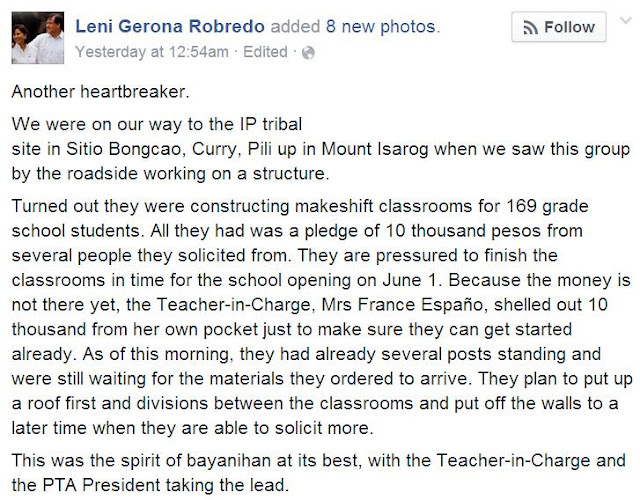 The posts I have been seeing on Facebook do not paint a good picture of how we are responding to the nagging challenges of basic education in the Philippines. The Alliance of Concerned Teachers has now likened the management style of DepEd secretary Luistro to that of Hitler while Luistro apparently has been quoted by Radio Veritas as calling critics of the new curriculum "prophets of doom". 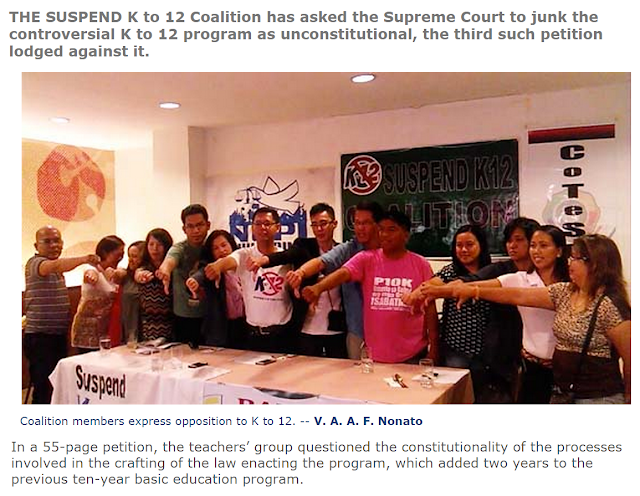 The issues plaguing Philippine basic education warrant a serious reflection from both sides. The discussion really needs to be elevated to a higher level, one that actually weighs the merits and weaknesses of both arguments. Imagine this scenario: A physician spends his time and effort finding funds to support the infrastructure and meet the operating expenses of a hospital that answers to the healthcare needs of poor indigenous people while the government takes the role of determining what medical advice, treatments and procedures should be given. This would be considered absurd in the medical field yet this is the current predicament of basic education in the Philippines. 5) more text interpretation in primary lessons. Ironically, the United States has not gained so much from these innovations because of its current obsession on accountability and standardized testing. A very strong argument against DepEd's K to 12 curriculum is its poor quality based on what we know from education research. Another equally strong case against the new curriculum is DepEd's clear lack of competence and capacity to implement the new curriculum. There is a third equally important reason: Focusing on the curriculum sets the wrong priorities for Philippine basic education. When it comes to priorities, who makes the judgment matters. With education, the voices of teachers should matter. 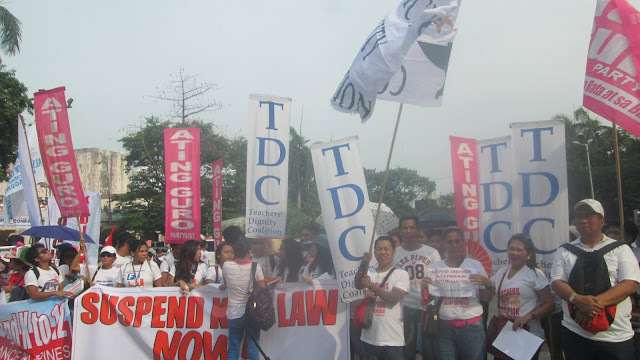 Here are the voices from two teacher groups in the Philippines, Teachers' Dignity Coalition (TDC) and the Alliance of Concerned Teachers (ACT). 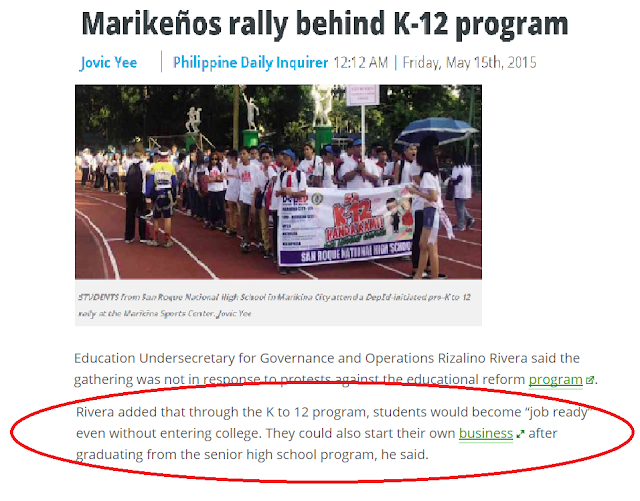 DepEd K to 12 Graduates Could Start Their Own Business, Seriously? DepEd has been using catchy phrases such as "learner-centered", "holistic development", and "globally competitive" while it promotes its new K to 12 curriculum. Recently, DepEd has framed its advertisement in simpler terms. Jovic Yee of the Daily Inquirer quotes Undersecretary for Governance and Operations Rizalino Rivera as claiming that "students ... could also start their own business after graduating from the senior high school program". Rivera does start with the old lie that the new curriculum would improve employment opportunities but this entrepreneurship assertion is simply outrageous. 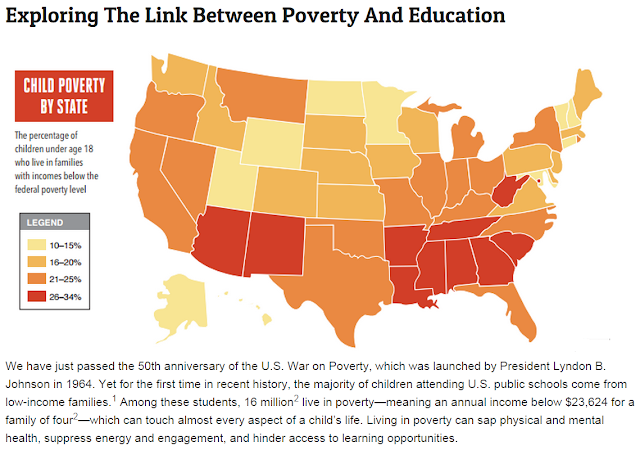 The public cost of providing two additional years of basic education is not insignificant by any measure. It is in fact a huge investment that requires nothing less than a thorough and thoughtful analysis of costs and benefits. Designing various tracks for these additional years likewise needs to be weighed against providing a general education for all. The largely assumed smoother entry into either the labor market or higher education provided by tracks can be fully canceled by significant disadvantages in later life. These are questions that need to be addressed especially when such a curriculum is planned to be implemented on a grand scale. "Teachers must be included in the process of curriculum development, regardless of the group of players who are primary in the process. 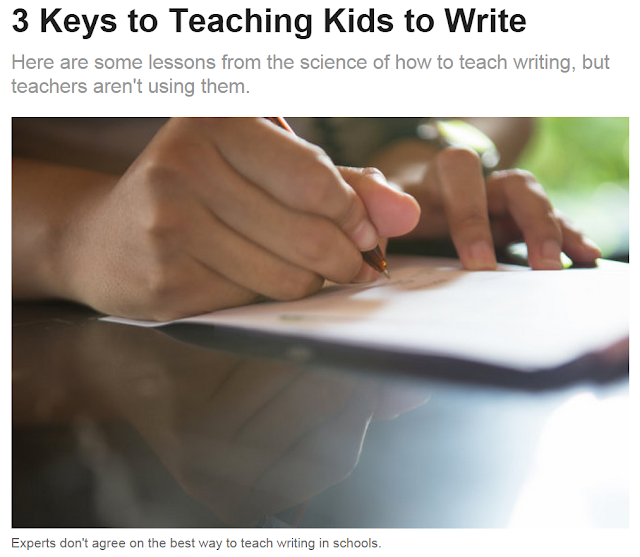 Teachers are the best source of information about what specifically will and will not work in a science classroom. They bring a strong note of reality to the process, through their familiarity with schools, communities, and the classroom environment." The above is an advice from the National Academy of Sciences in the United States. This advice is often heard, but unfortunately, too frequently ignored. 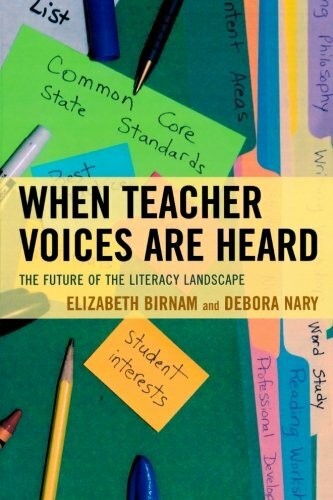 Elizabeth Birnam and Debora Nary, after following a literacy reform in one school district conclude that "the power to effectuate change must come from the collective, unified voices of the teachers - the boots on the ground". In their book, When Teacher Voices Are Heard, they likewise identify the following as key to a successful education reform: transparency, open-mindedness, and the power of the collective. There are two types of classrooms in basic education. One type has children as students. The other has teachers as students. In the Philippines, overcrowding and insufficient learning resources continue to hound classrooms where children learn. The travesty is that the same actually holds for rooms where teachers are trained. Almost a thousand teachers are trained on a new curriculum in two batches, each one covering a period of five days. 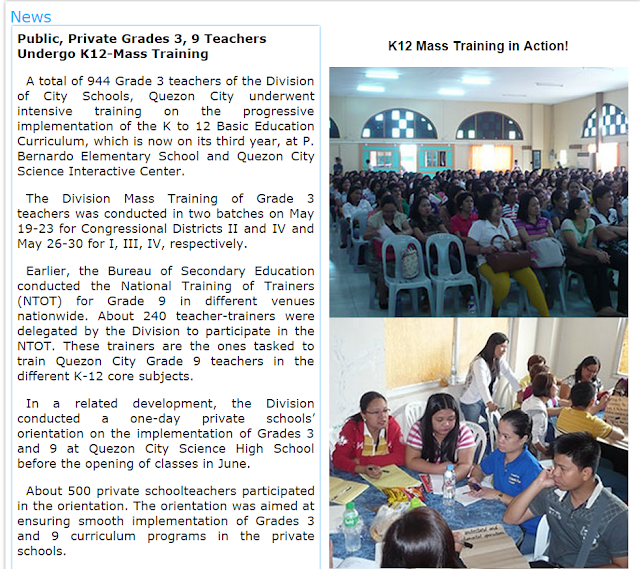 In addition, five hundred private school teachers are given a one-day orientation on the implementation of the new curriculum in grades 3 and 9. Seeing this piece of news and its accompanying photos makes it quite clear how much (or how little) thoughtfulness and attention DepEd gives toward the implementation of its new curriculum. Ted Lieu, a representative in the US Congress from California, vividly describes how education often fails society. "I think it's easy for people like you and me, who wear suits and ties and work in offices, to cast aspersions on those with 10th grade educations. And I certainly hope you're not saying that only those with college degrees or high school degrees should be eligible for federal benefits. Part of critical thinking is to consider multiple perspectives. Correctly weighing on an issue requires judiciously examining both sides while being firmly guided by evidence. With regard to DepEd's K+12, it is a helpful exercise to look at what proponents are saying in defense of the new curriculum. Part of the defense is making promises or threats. One promise that DepEd makes is that the new curriculum will ease unemployment. DepEd seems to think that reducing unemployment is as easy as obliterating "un" from the word "unemployed" on a chalkboard. Arvil Adams writing for the Education for All Global Monitoring Report makes the relationship between education and employment quite clear with a section heading in the paper entitled The Role of Skills Development in OvercomingSocial Disadvantage. It even comes with a graph to prove the point. 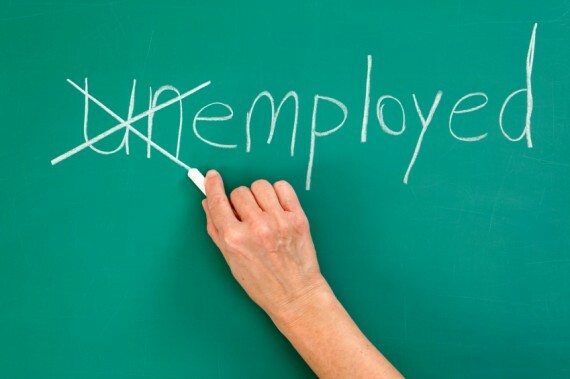 Vocational education and training offers no guarantee as a solution to youth unemployment. The Only Ones Opposed to K+12?